Self-Guessing  is requiring a generalizer to be able to reproduce a learning set, given only a part of it. Strong self-guessers, such as humans, are able to do this without any prior knowledge of the learning set. Humans do this by applying a set of mental models to the visible parts of a learning set, see if these patterns generalize well to other visible parts, and when this happens, use these patterns to fill in the obscured part. 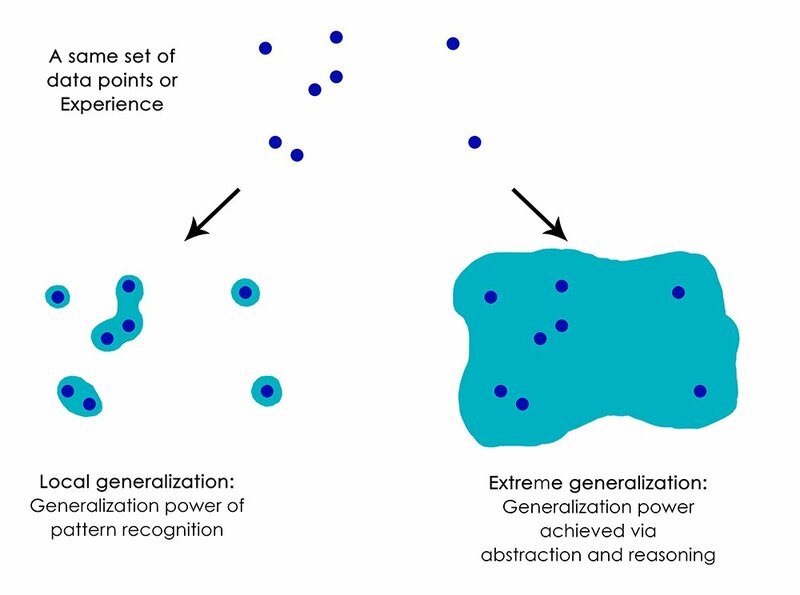 Combining inspirations from algorithmic information theory, ensemble learning, symbolic AI, deep learning, and the mapper from topological data analysis, we create a strong self-guesser that is capable of extreme generalization on multi-dimensional data: solving many different problems with little or no data and automatic parameter tuning. Prior knowledge. Perhaps you know that Nature is fond of symmetry and this seems to be an organism. Perhaps you know that a sea star has five arms. Perhaps you scanned the internet for popular images and seen this exact image before. Game theory. You could try to infer my reasoning for posting that image. Surely, the author won’t try to trick us by putting up the ultra rare sea star with four normal legs and one stump? Self-Guessing. You fit texture -, rotation -, and shape models on the visible parts of the image to impute the non-visible parts. The first approach state-of-the-art for inpainting is in  and for scene interpretation in . The second approach is studied with incomplete information games , and inverse reinforcement learning (given my behavior through actions, what is the policy I am optimizing? ), a recent overview is given in . This article is about the third approach, self-guessing, as studied in classical AI . We first place our algorithm in the context of existing research. We then describe our solution and what is different. 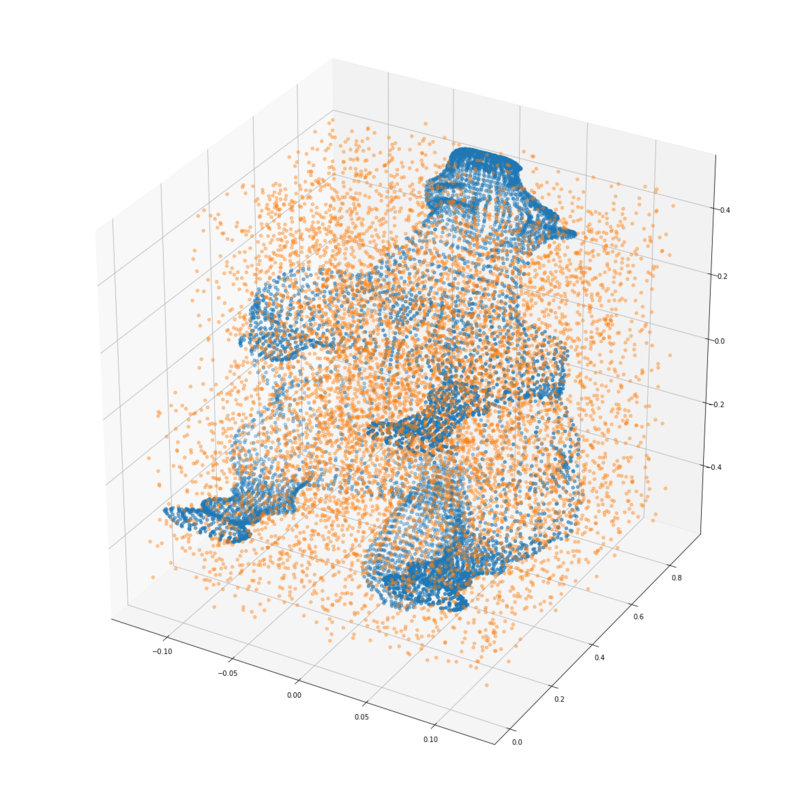 Experiments are shown for 1-D, 2-D, and 3-D point-cloud data. Finally we discuss the results and future possibilities. One needs to understand a sentence to perform tasks like imputing missing words , or accurately predicting the next character . Special-purpose compressors, such as DjVu , use character recognition to segment text from noise or background imagery, and as a result get higher compression rates on scanned documents and brochures. Compression can be measured by looking at compression ratio’s. The more regularities (predictable patterns, laws) the compressor has found in the data, the higher the compression ratio. The absolute shortest program to produce a string gets the highest possible compression ratio. The first string is easy to describe with a short program called a Run-Length Encoder: "10"*16. The second string is seemingly more complex. However, you can not calculate the shortest program for all strings. A string could always have a shorter description you just haven’t found yet (for instance "The first 1000 digits after the first 58533 decimals of Pi"). We can approximate the Kolmogorov Complexity with real-life compression algorithms (K'). The better the compressor the closer it approaches Kolmogorov Complexity K.
Since compression is computeable we can now apply the concepts of Kolmogorov Complexity and Information Distance. For instance, one can use estimated KC to rank all possible sequence continuations (the continuation with the lowest resulting estimated KC fits better). This makes it possible to generate new music  (and to control for the desired amount of “surprise”  by moving up or down the ranks: demo). Levin originally in the 70s , and then Schmidhuber practically in the 90s , used the all-string-generating program concept to create universal search, followed by Hutter’s universal problem solver with simplest solution guarantee for all well-defined solvable problems in existence: Simply generate all possible binary programs starting from 0 and pick the first program to solve the problem at hand (gives the desired outcome y, when given the problem as input) . A hard run-time cap (and even multiverse parallelization ) is put forward to deal with non-halting or slow programs. Schmidhuber’s student at the time, Marco Wiering , came up with the idea of ordering the space of all possible programs by their previous successes in solving particular problems, resulting in Adaptive Universal Search. With this optimization, for all problems seen before, the search algorithm will now find a better candidate program faster than an exhaustive generation. Coarse-graining lossy compresses a space or dataset. Images can be thresholded, quantized, or segmented. 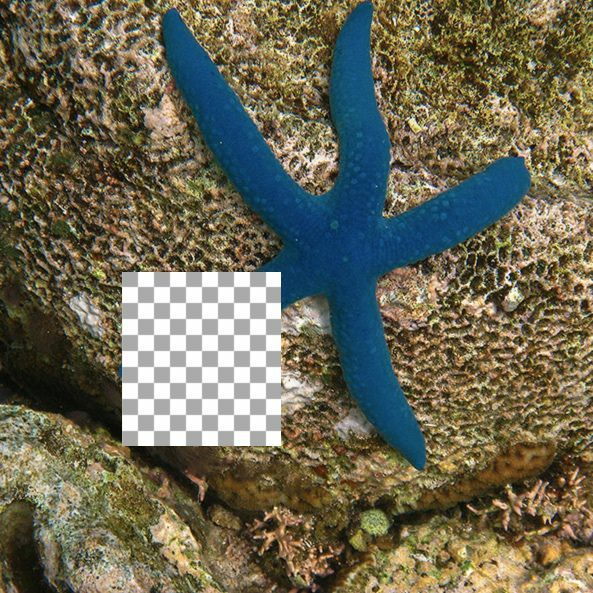 The above image shows A) Sea star thresholded B) Sea star quantized to 9x9 C) Sea star segmented from the sea bed below. Even though the segmented sea star removes most of the information/uncertainty of the original, it is still the most useful for self-guessing structural missing object parts (to impute textures you’d need another approach). Coarse-graining is not exclusive to images. Text, tabular data, and even Markov Chains can be compressed too:  uses hashing to obtain a fixed dimensionality on highly sparse text data,  quantizes feature columns to speed up the performance on a GPU, and  compresses nearby nodes in a Markov Chain. In the paper “Optimal high-level descriptions of dynamical systems” the authors introduce the State-Space Compression Framework (SSCF) . They formalize and quantify a purpose of a scientist studying a system: The need to predict observables of interest concerning the high-dimensional system with as high accuracy as possible, while minimizing the computational cost of doing so. For instance if the system is the economy of a country, and the observable of interest is the GDP, this frameworks guides the scientist through finding a set of coarser features and a model that best predicts future GDP. Where κ and α are modifiers for trading off “cost of complexity” or “cost of error” respectively. Cost of complexity can be computed information-theoretically by looking at the program length of the model and adding the execution times. Cost of error can be established through a local evaluation. Caruana et al. showed a method to extract every bit of predictive power from a library of models. Models are selected in a feed-forward manner, picking the model that improves train evaluation the most. Choice of evaluation metric is free. Caruana, and later Kaggle competitors , showed the effectiveness of this technique for obtaining state-of-the-art, with model libraries growing to thousands of different models. Diversity can be enforced through subsampling the library at each iteration. The \(MAPPER\) algorithm  is able to transform any data (such as point-cloud data) or function output (such as a similarity measure) into a graph (or simplicial complex). This graphs provides a compressed, meaningful summary of the dataset. The graph is created by projecting the data with a filter function. These filter functions may be chosen from any domain. The filter function is then covered by overlapping intervals (or bins). Points inside a bin are clustered to form the nodes of the graph. A vertice between two nodes is drawn when a single point appears in both nodes. This only happens due to the overlap of the bins, and so an overlap is a key element to creating graphs with the Mapper method. An accessible formal introduction appears in  and more advanced overviews are given in  and . There are a number of open source and commercial applications that implement Mapper: , , , , , , . Though not all implementations use the exact same methods, for instance Python Mapper  operates on distance matrices, and KeplerMapper  on vector data. We will use a modified KeplerMapper for our experiments. More advanced validation techniques include stratified k-fold validation: The folds are created, such that the distribution of the target in the test set is equal to the distribution of the target in the train set. Stacking, or stacked generalization,  can be seen as cross-validation where you save the predictions on the test folds. These saved predictions are then used by second-stage models as input features. Stacker models can both be linear and non-linear. Stacked ensembles work best when base generalizers “span the space”. We should thus combine surface fitters, statistical extrapolators, Turing machine builders, manifold learners, etc. to extract every bit of information available in the learning set. Instead of fitting a single map from input to output, apply multiple (higher-level) models to “milk” the dataset for all its information. In , the authors provide an explanation for the neural basis of procedural memory. Procedural memory stores information on how to perform certain procedures, such as walking, talking and riding a bike. Procedural memory is acquired by trial and error. Procedural memory is divided into 3 types; motor, perceptual, and cognitive. Humans are not even aware that the procedural task they are performing is learned: It comes naturally, like reading and recognizing words. Only when we make the task hard or add new elements, do humans need active attention: Reading words in a mirror usually requires enhanced focus and concentration (but with enough practice can be made procedural too). We have an idea to employ Mapper and filter functions to act as generalizers in the self-guessing framework to build a model of perception and perceptual reasoning that is close to human cognition. Inspired by the State Space Compression (SSC) framework, we gather a set of filter functions, that, when combined, generalizes to the inverse image with as high accuracy as possible, while minimizing the computational cost of doing so. Unlike SSC framework’s main purpose of predicting variables of interest, our variables of interest are the original data points. We also ignore any temporal dynamics that makes the SSC framework so powerful. Where p, r, and d are modifiers to weight Program Length, Runtime, and Dimensionality (the number of filter functions in the set). The d modifier is set to small, to act as a tie-breaker and prefer a lower dimensionality when all other factors are equal. We manually construct a small library of filter functions with a focus on geometrics and simple vector mathematics. Statistical functions (mean, max, min, std). A wide range of distance metrics and the possibility to turn the data into a distance matrix. 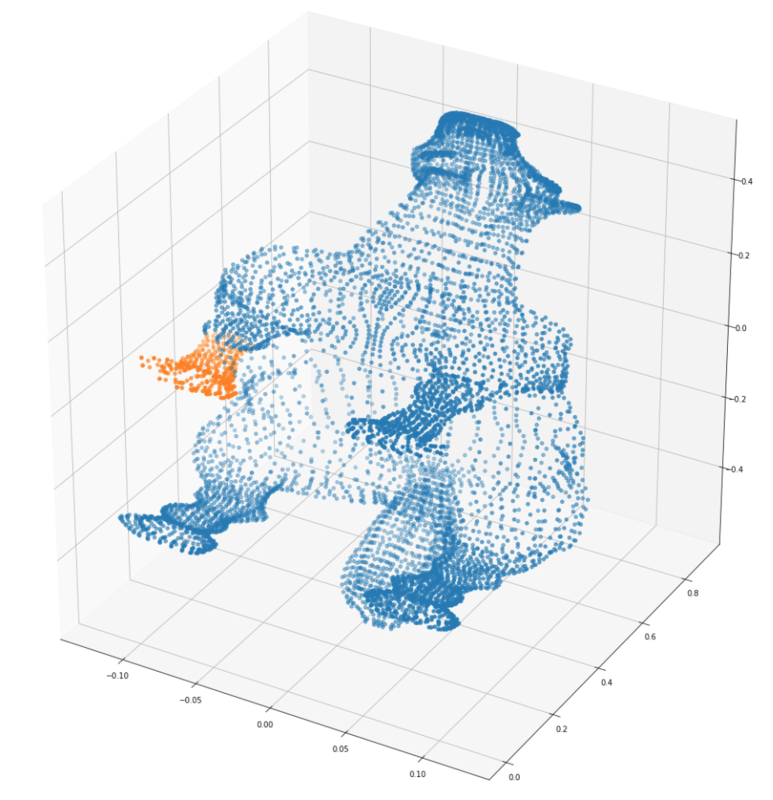 All unsupervised dimensionality reduction algorithms supporting the Scikit-learn  API, such as neural gas , UMAP , or t-SNE . All supervised algorithms supporting the Scikit-learn  API, such as XGBoost , Keras , or KNN . Our library of filter functions is what we tongue-in-cheek call “Kaggle-complete”: Using this library alone allows one to compete and win in any competition on Kaggle , since any modern algorithm can easily be ported to (or has already been ported to) use the Scikit-Learn API . All filter functions are exhaustively ranked by a function of their accuracy and complexity, much like . These are then forward combined into a stacked ensemble, for as long as this improves local AUC evaluation. The best combination of filter functions for particular data are those sets that generalize well to this data and are simple (either of lower dimensionality or cheap to compute). Ranks are saved and, like Adaptive Universal Search , used to order the filters (in an attempt to speed up the finding of good filter sets for future problems). For every filter function, we project the data with it. We then cover the projection with (possibly overlapping) intervals. We use the projection outside the interval as features and try to predict the inverse image/original data inside the interval with a self-supervised classifier (using real points (or 1) as the positive class, and random points (or 0) as the negative class). As the dimensionality and resolution gets higher we switch to sampling data points, instead of obtaining predictions for each datum, to relief computational strain. We reconstruct the generalization/ self-guessed predictions with Mapper to generate a simplicial complex. This compressed representation of the data will impute any missing data using the predictions from the set of filter functions. We can also reconstruct the original Betti numbers  of the data. To evaluate filter function sets we use a simple decision tree  with entropy-splitting criteria. This non-linear decision tree allows for fast evaluation, while keeping the results very interpretable. For our final generalizer we switch to a 5-layer MLP  for its extrapolation prowess (tree-based algorithms deal poorly with unseen data outside of the ranges of the train set). Despite best practice, we do not normalize the input data . 5 layers are used, because using less layers does not always give accurate solutions (depending on the chosen random seed), while using 5 layers shows no such variance, no matter initial conditions. Optionally, our solution allows for incrementing the number of layers one-by-one, and see/study if there is enough generalization power in the neural net to describe the object (given the coarser filter function outputs as features). Our self-supervised model is a single decision tree, showing that even very simple models can be used to reconstruct the original data. 1 1 0 0 1 1 0 ?
? 1 0 1 0 1 0 ? Here the problem was designed to show the shortcomings of neural networks , despite of their well-known, but sometimes misleading, capability to be universal function approximators (sharing that status with decision trees ). Gary Marcus shows us a seemingly very simple problem that can not be solved with deep learning under few-shot constraints. Here’s a function, expressed over binary digits. If you are an ordinary human, you are probably going to guess 111. If you are neural network of the sort I discussed, you probably won’t. The function we are self-guessing here is a reversal function. 1 1 1 ? ? ? 1 1 0 0 1 ? 1 0 0 0 0 ? 0 1 0 0 1 ? 1 1 1 1 1 ? such a model also generalizes to more complex self-guessing problems we will showcase later on. it shows that the feature engineering through self-guessing and topological modeling makes the choice of model less relevant (the problem is mostly solved before gradient descent or entropy-based splitting sets in). we could make self-guessing a compositional part of a (randomly searched or differentiated) deep net architecture, improving the generalization and extrapolation power of these models even more. The self-guesser is able to learn FizzBuzz Lite from 15 samples (the first sample is arguably mislabelled). This is very easy to solve with the strong self-guesser, because the self-guesser does not have to worry about possibly imputing missing binary counts. It finds y%3 first (more accurate on this data), then y%5. The self-guesser starts to fail again. We lost the meaningful y-axis for solving this problem. Just like filter function set is important, so is the parametrization of the (multi-scale) mapping of the data important. 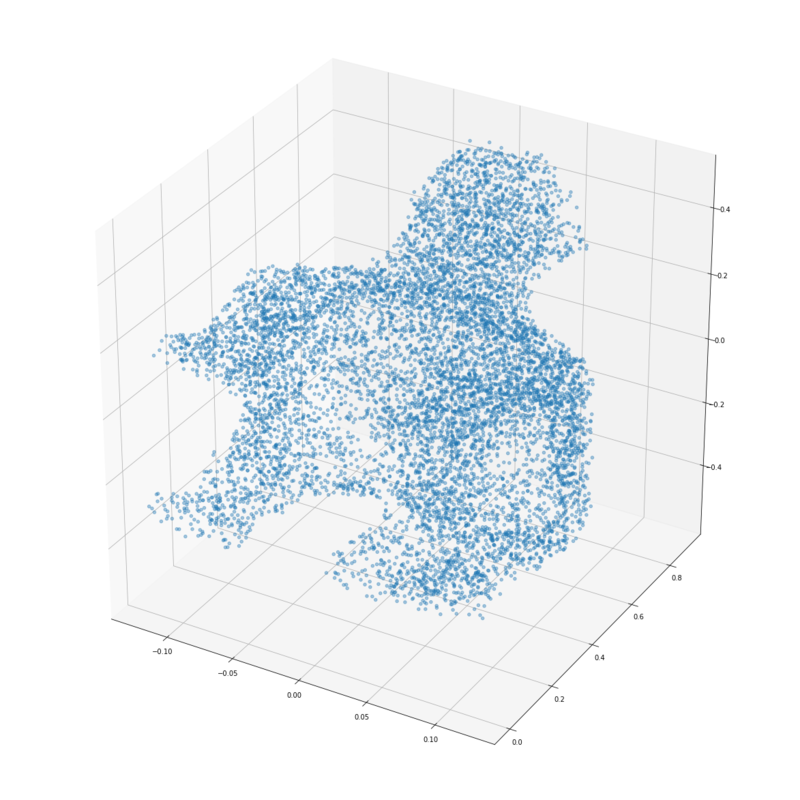 It would be nice if we could automatically find good covers/posing of data too, but like the all program generator, this suffers from a combinatorial explosion (and there are infinitely many ways to multi-scale map real-valued data, so there really is no free lunch here ). But at the cost of increased complexity (higher dimensionality of the filter function set, longer filter function program length, and longer run-times). For the circles dataset we use sampling for the negative class. We removed the bottom 25% of the data. We then generate random points and have a classifier predict them as 0 (random) or 1 (reality/fits on manifold). ? ? 1 0 1 1 ? ? Showing the potential for data generation. We flip 3 pixels from this intricately patterned 200x200 black and white image. With self-guessing locating (and thus correcting) the anomalous features. Our goal is to find a set of filter functions / data projections that is performant in classifying between random noise and real order. To describe the entire object (including the missing foot) the self-guesser was not able to use 3 or less dimensions. But the compression is achieved in other ways: Given a single row of filter functions, a fitted model, and a random noise generator, a decompressor can now reconstruct the original with high accuracy (while the lossless original point-cloud consisted of 1000+ rows with 3-D points). If a particular horse really was missing a foot, the bad generalization performance would describe this as an anomalous and complex part: The self-guesser would use symmetry and order of the object to predict there was a foot inside of the box, so when it is not there, something is anomalous/not right/surprising. This means our self-guessing program can be used “pre-trained” for similar objects, so we know adaptive search could also yield faster solutions. Keep a small “Procedural Memory” library of diverse filter function sets that are accurate and cheap to compute for a wide variety of data. Try these first, and mutate the most performant ones. Random sample n points from two objects and sum the distances from every point to the nearest point in the other object. We find a compression map that uses similar (but ultimately different) set of filter functions: The space and time of computation needed by the approximated shortest program, to output one object given another object as input. We turn the Iris dataset  into a single-class dataset. We then evaluate it on the entire dataset. We achieve similar cross-validation scores as a regular classifier trained one vs. all. When we feed the entire raw dataset, we see an interesting result with the strong self-guesser, showing that self-guessing transcends machine learning into artificial intelligence: The self-guesser finds and then exploits the fact that this canonical dataset is not randomized and that all target variables appear the same time, resulting in a short, but highly accurate generalization program. Only when presented with the data unordered will the self-guesser expend more energy for creating real predictions. Though the framework was inspired by AIT theory, and is shown to work in practice, this article itself has not convincingly build a theoretical framework for a universal self-guesser. For instance, the step from lossless to lossy compression models is not really justified. Instead of program complexity, we are then minimizing the complexity of portability, re-use, and open source collaboration: A handcoded perceptron is now more complex than using a pre-written implementation of an MLP in Scikit-learn or Keras. Reference Length and Program Length could also be combined to rank a 5-layer MLP as higher complexity as a 2-layer MLP. In the same vain one could estimate complexity by looking at hardware requirements (or perhaps better, direct energy usage). Communicating a filter function set that requires expensive GPU’s or TPU’s to run is not very portable. Program running times become less relevant with the advent of parallel computing: The 4 hours required by AlphaZero to play chess should be seen relative to the energy-hungry TPU farm that ran it. Some datasets cheat, in that the data is pre-centered or pre-normalized. For instance, taking the l2-norm as a filter function to describe a circle only works when centering a circle on the origin of a graph. For human perception, some processes must be responsible for segmenting and centering an object inside a “bounding box” of focus, such that more filter functions become available. To use the self-guessing mapper as a plausible model for human perceptual reasoning this segment-and-center problem would need to be solved. By mapping an object with multiple differently sized intervals/resolution it now becomes possible to find short programs that describe the complexity of the entire object, but also of its large subparts, down to the level of detail. 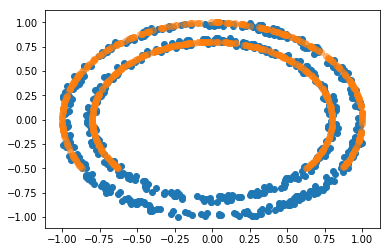 Consider a sphere with a rough noisy surface: The global complexity is low (it can easily and accurately be described by lower-dimensional filter functions), but the fine-grained complexity is high. It may have been possible to put this framework into another existing field other than that of self-guessing. There seem to be some similarities with MDL, neural embeddings, and (random) kernel learning. As far as we know, this particular combination of AIT, topological mapping, and self-guessing/extrapolation is unique and may provide other insights and practical tools to complement related fields. Python code  for replicating all the graphs is available upon request by opening an issue (Note: highly experimental research-level code with likely bugs and inefficiencies). Cleaned up code and notebooks will be made available in the future. Manually expanding the filter function library with manual GOFAI or symbolic functions (nature). Genetic generation of filter functions using generalization performance, diversity, and simplicity as a fitness function (nature/nurture). 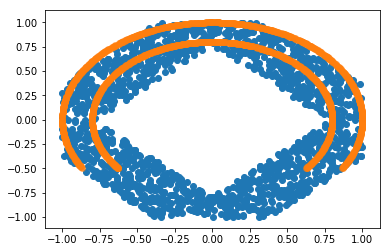 Differential programming where the filter functions are optimized with gradient descent to minimize error, with a fixed simplicity budget (nurture). Adding complete (Bayesian, Compression, Neural Network, Unsupervised/Auto-encoder) models as filter functions to allow for mapping on data more complex than binary/point-cloud. Appreciating that a filter function itself can also be composed of other, more simpler, (possibly stacked) filter functions which could be found through meta-learning: pop-push should not be generated for lists of a particular size, but generalize to lists of any size. Reference length and hardware complexity.